When I made this card, I was really just playing with possibilities but was quite pleased with the way it turned out. 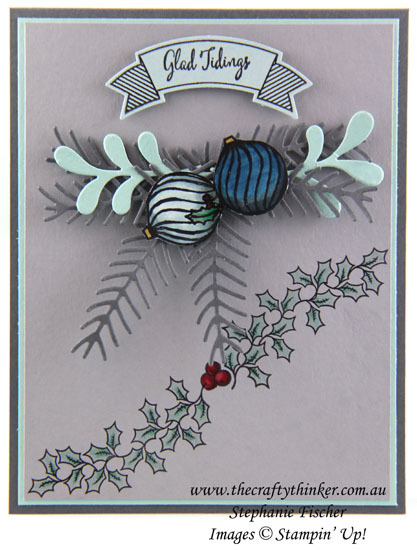 I stamped, coloured and cut out the baubles from the Jar of Cheer image and added them to a spray of leaves cut with the Pretty Pines Thinlits. I stamped the holly directly onto the card front and watercoloured lightly. The banner is from Thoughtful Banners and I added the greeting from Merriest Wishes before cutting it out with the matching punch.